She'll be coming round the mountain when she comes. She'll be driving six white horses when she comes. And we'll all go out and meet her when she comes, etc. And we'll all have chicken dumplin's (2) when she comes, etc. (1) It is a typical Hill Billy tune, very popular in the States. A Hill Billy is a kind of farmer in the hills. He is usually poor because the land is not very good, and he often lives isolated with his family. This song is also regarded as a tongue twister, that is a phrase difficult to pronounce, especial¬ly when it is sung very fast. (2) Dumplin's: dumplings, that is a dough mixture cooked in broth. Every European country has its own traditional folktales, but the American past is short and well-documented, so America has very few traditional folktales of her own. But Americans do have the cowboy, and his adventures in films follow the same themes that we find in all folktales: a brave man, with only his horse as a companion, particularly skilful with his pistol and rope, also called ' lasso ', who always fights and wins against evil. Such is the usual hero presented in the movies. Certainly in the days of the western frontier cowboys led a dangerous life and worked very hard. 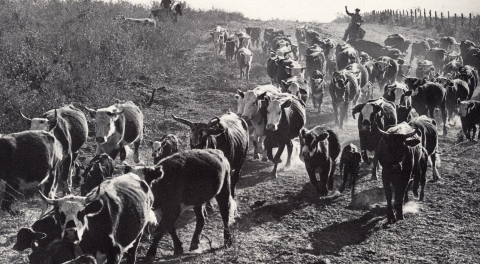 They worked on ranches in Texas, Montana, and other western States and they spent long, hard weeks driving cattle from their ranches to railroad towns where the cattie were shipped to the markets of the East. Nowadays life on cattle ranches has changed greatly. Cowboys still use their ropes to catch calves; they feed the cattle and do all the other work but today they use machines for many jobs that earlier cowboys had to do themselves. For example, many American ranchers, in order to search for cattle in the distant parts of the ranch, use helicopters, so life on ranches is no longer lonely and, maybe,has lost the charm of adventure.